Added a visualization of the revision graph in the revision log. Implementing support for Monotone-like VCS (like hg, git, bzr) in Trac has to overcome the assumption of a linear succession of changesets, inherited from Subversion. Considering 2.0 enhancements it would be great to support monotone ​http://venge.net/monotone/ SCM system. It grows very fast and was considered by Linus Torvalds to replace BitKeeper, in fact git (a fast written Linus's tool to manage Linux sources w/o any SCM) was desinged based strictly on ideas behind monotone. 1492-hg-parent-revs-r9946.patch​ (1016 bytes ) - added by Remy Blank 8 years ago. Patch for mercurial-plugin-0.12 to provide Repository.parent_revs(). log-graph.png​ (140.7 KB ) - added by Remy Blank 8 years ago. Example log graph (from the hg-crew repository). trac-git-octopus-merge-graph.png​ (55.1 KB ) - added by hvr@… 8 years ago. See also the Darcs support patch in ticket #638. 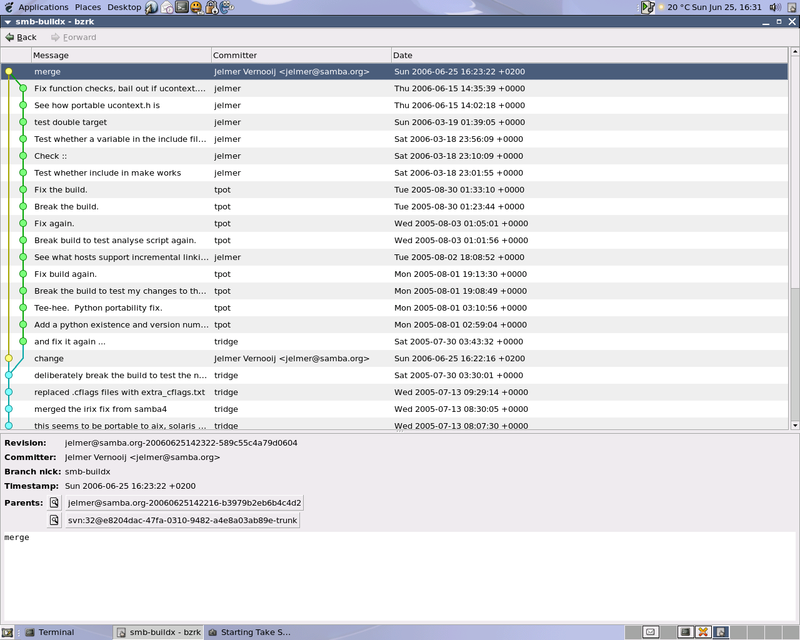 It contains a generic SCM backend interface that the Monotone support probably could implement. As current head cat-herder/developer behind monotone, I thought I'd put in a word here… I'm definitely interested in seeing this happen (it'd be nice to use trac for monotone development itself!). I thought a bit about adding it myself, but simply don't have the time; but, if someone else decides to take a shot at it, we'd definitely be interested in helping provide info, fixing interfaces to be more usable, etc. Monotone might be an interesting target in any case, since it's one of the most different VCSes from subversion — unlike subversion it has first-class branches and tags (so a monotone repo is not a simple singly-rooted tree), and unlike, say, darcs or arch or bzr-ng, it has microbranches (so even within a branch, history is a DAG, not a line). Looking at source:trunk/trac/versioncontrol/api.py#2127​ , the current API seems to assume that history is a straight line (e.g., that each revision has exactly one predecessor and successor); this simply isn't true for several of the new generation of VCS tools. So if you can support monotone, you can probably be pretty sure that your design can support anything :-). Development of a trac plugin for connecting to a monotone repo has been started, see ​http://www.ipd.uni-karlsruhe.de/~moschny/TracMonotone/. I'm setting a milestone here for the improvements on the versioncontrol API and web interface, not for the plugin itself, of course. For the problem of long revision ids, see #3533. As mentioned in comment:5, the biggest challenge for integrating Monotone-like VCS (like hg, git, bzr) in Trac is the assumption of a linear succession of changesets. For 1. it's possible to follow the first parent/first child, as I've done in TracMercurial. In case this is not what is wanted, it's always possible to follow explicitly the second parent or another child from the changeset view. For 2. the linear view in the TracRevisionLog is really problematic. There should be at least some indication that a given changeset is either a branch point or a merge point (or both, of course). We should remove the "previous" and "next revision" links, and instead only have the set of "parent" and "child" links. But there's more than that. In the vc api we should clearly separate the notions of "before/after" and "parent/child". As you wrote somewhere in a comment, these two are not interchangeable even for subversion, and they are surely not for Monotone. However, both concepts may be needed. The timeline clearly uses the first concept, while the changeset view relies on the second. What people really want (but that might be some work to get it implemented) is a gitk/hgk/bzrk like display of the history, be it for repositories (resp. branches) or single nodes. for examples of how it could look like. The other possible visualization method preferred by many people is a graph of revisions, similar to that provided by the ​th:wiki:RevtreePlugin. In case of Monotone, the "standard" visualization is that generated by ViewMTN and monotone-viz. The discussion about the visualization pertains rather to #1445. As noted there, I think that while a graphical representation is neat, we should first concentrate on getting that information available in a clear way in the traditional TracRevisionLog HTML view. As noted there, I think that while a graphical representation is neat, we should first concentrate on getting that information available in a clear way in the traditional TracRevisionLog HTML view. Sure. But instead of inventing a new way to linearise a dag like revision history, we should have a look at what existing ("..k") tools do; that was the intention of my comment:15. As the VcRefactoring is scheduled for 0.12, shouldn't this ticket also be? Well, the VcRefactoring page describes the on-going effort to improve the (D)VCS support in Trac. As such, it's not strictly tied to 0.12 or any milestone in particular. For 0.12, the most likely improvement in the vc refactoring area will be the MultipleRepositorySupport, so having this ticket scheduled for 0.13 is actually a good fit. branch for seeing more ancestors (and incoming branches for that branch). Note that for Subversion 1.5+, we could support svn log -g in a similar way. For efficiency, we should probably also record if a given changeset was a merge changeset, in the cache. #8478 was closed as duplicate (suggested comment:22 approach). I currently favor the comment:23 approach. Also, this plays well with the recent suggestion of Georg to show the changesets belonging to the current branch, in Mercurial (hg log --follow-first). Add methods to get the parent / child relationships between changesets. Use that information to display the graph. This would already make Trac much more usable with DVCS. I have a proof-of-concept running here, using SVG for graph display (but this could easily be adapted to use a <canvas> instead). It uses a similar algorithm as Mercurial, generalized to the n-parent case. For a Mercurial repository, it displays the same graph as Mercurial itself. I need to clean it up a bit, and find a way to align the graph items with the corresponding revision log rows. When that's done, I'll put it up here for review. Adds Repository.parent_revs() to return the direct parents of a revision. Renders the graph as SVG when viewing the log of the root of a repository. Works with all major browsers (Firefox, Chrome, Opera, Safari, IE). 1492-hg-parent-revs-r9946.patch​ implements Repository.parent_revs() in mercurial-plugin-0.12. Here's an example of the output on Firefox (showing a part of the hg-crew log). Feedback very welcome. Thanks for the very quick feedback! Note that children_revs() isn't actually needed, so I didn't define it in the API, but we might add it for symmetry. One more thing: could you please try and see how an octopus merge is rendered? Thanks! It's not pretty, but still readable, and the algorithm seems to work. I assume 8-legged octopus merges shouldn't be too frequent (git newbie here). Graph data is pruned to lower the page size. Works well on FireFox, Chrome, Opera and Safari. Uses Explorer Canvas on IE, but the result is not yet satisfactory. The graph only seems to appear in quirks mode, and for some reason, the height of the rows in the log is larger than in other browsers (and different between IE7 and IE8! ), so the graph doesn't align. I'm quite convinced that <canvas> is the way to go. Rendering on IE still needs some work (including fixing the weird row height bug). Feedback welcome. The current tip of the branch now works well (most of the time) with IE8. Unfortunately, the fix breaks the .change column on IE7, and the latter still has rows that are too tall. For review, here's a diff of the branch against trunk. The <canvas> implementation has been committed in , with some minor tweaks to the presentation. This was the most pressing missing feature for DVCS, so I'm closing this ticket. Please open new tickets for other feature requests. Oh, and for a (not too branchy) demonstration, see rblank.